Aššur (/ˈæsʊər/; Akkadian; Syriac: ܐܫܘܪ‎ Āšūr; Old Persian 𐎠𐎰𐎢𐎼 Aθur, Persian: آشور���: Āšūr; Hebrew: אַשּׁוּר: Aššûr, Arabic: اشور‎), also known as Ashur and Qal'at Sherqat, was the capital of the Old Assyrian Empire (2025–1750 BC), the Middle Assyrian Empire (1365–1050 BC), and for a time, of the Neo-Assyrian Empire (911–608 BC). The remains of the city lie on the western bank of the Tigris River, north of the confluence with its tributary, the Little Zab, in what is now Iraq, more precisely in the al-Shirqat District of the Saladin Governorate. Occupation of the city itself continued for approximately 4000 years, from c. 2600 BC to the mid-14th century AD, when the forces of Timur massacred its population. The site is a World Heritage Site, having been added to that organisation's list of sites in danger in 2003 following the conflict that erupted following the 2003 invasion of Iraq and as a result of a proposed dam which would flood some of the site. Assur lies 65 kilometres (40 mi) south of the site of Nimrud and 100 km (60 mi) south of Nineveh. Exploration of the site of Assur began in 1898 by German archaeologists. Excavations began in 1900 by Friedrich Delitzsch, and were continued in 1903–1913 by a team from the Deutsche Orient-Gesellschaft led initially by Robert Koldewey and later by Walter Andrae. More than 16,000 clay tablet with cuneiform texts were discovered. Many of the objects found made their way to the Pergamon Museum in Berlin. More recently, Ashur was excavated by B. Hrouda for the Ludwig Maximilian University of Munich and the Bavarian Ministry of Culture in 1990. During the same period, in 1988 and 1989, the site was being worked by R. Dittmann on behalf of the Deutsche Forschungsgemeinschaft. 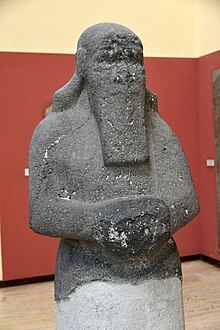 Aššur is the name of the city, of the land ruled by the city, and of its tutelary deity from which the natives took their name, as did the entire nation of Assyria which encompassed what is today northern Iraq, north east Syria and south east Turkey. Today the Assyrians are still found throughout the Middle East, particularly in Iraq, Iran, Syria, Turkey, and the Diaspora in the western world. Assur is also the origin of the names Syria and terms for Syriac Christians, these being originally Indo-European derivations of Assyria, and for many centuries applying only to Assyria and the Assyrians (see Etymology of Syria) before also being applied to the Levant and its inhabitants by the Seleucid Empire in the 3rd century BC. By the time the Neo-Sumerian Ur-III dynasty collapsed at the hands of the Elamites around the end of the 21st century BC according to the Middle Chronology and mid-20th century according to the Short Chronology following increasing raids by Gutians and Amorites. The native Akkadian-speaking Assyrian kings were now free while Sumer fell under the yoke of the Amorites. 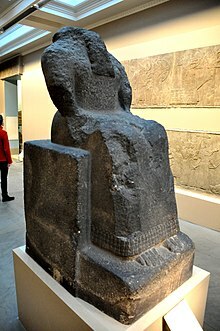 The Assyrian king Ushpia who reigned around the 21st century BC is credited with dedicating the first temple of the god Ashur in his home city, although this comes from a later inscription from Shalmaneser I in the 13th century. The temple likely dates to the original settlement of the site when the people of Ashur established their nation under the patronage of the city's god. 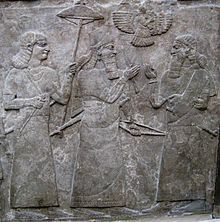 Soon after in around 2000 BC, Puzur-Ashur I founded a new dynasty, with his successors such as Ilushuma, Erishum I and Sargon I leaving inscriptions regarding the building of temples to Ashur, Adad and Ishtar in the city. Prosperity and independence produced the first significant fortifications in this period. 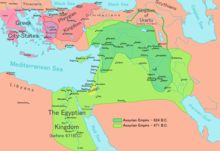 As the region enjoyed relative peace and stability, trade between Mesopotamia and Anatolia increased, and the city of Ashur greatly benefited from its strategic location. Merchants would dispatch their merchandise via caravan into Anatolia and trade primarily at Assyrian colonies in Anatolia, the primary one being at Karum Kanesh (Kültepe). The city revived during the Parthian Empire period, particularly between 150 BC and 270 AD, being resettled and becoming an administrative centre of Parthian-ruled Assuristan. Assyriologists Simo Parpola and Patricia Crone suggest Assur may have had outright independence in this period. Other polities such as Beth Garmai, Beth Nuhadra and Adiabene also flourished due to the fact that the Parthians exercised only loose or intermittent control of Assyria. New administrative buildings were erected to the north of the old city, and a palace to the south. The old temple dedicated to the national god of the Assyrians Assur (Ashur) was rebuilt, as were temples to other Assyrian gods. German archaeologist Klaus Beyer published over 600 inscriptions from Mesopotamian towns and cities including Ashur, Dura-Europos, Hatra, Gaddala, Tikrit and Tur Abdin. Given that Christianity had begun to spread amongst the Assyrians throughout the Parthian era, the original Assyrian culture and religion persisted for some time, as proven by the inscriptions that include invocations to the gods Ashur, Nergal, Sin, Ishtar and Shamash, as well as mentions of citizens having compound names that refer to Assyrian gods, such as ʾAssur-ḥēl (Ashur [is] my strength), ʾAssur-emar (Ashur decreed/commanded), ʾAssur-ntan (Ashur gave [a son]), and ʾAssur-šma' (Ashur has heard; cf. Esarhaddon). The Roman historian Festus wrote in about 370 that in AD 116 Trajan formed from his conquests east of the Euphrates the new Roman provinces of Mesopotamia and Assyria. The existence of the latter Roman province is questioned by C.S. Lightfoot and F. Miller. In any case, just two years after the province's supposed creation, Trajan's successor Hadrian restored Trajan's eastern conquests to the Parthians, preferring to live with him in peace and friendship. There were later Roman incursions into Mesopotamia under Lucius Verus and under Septimius Severus, who set up the Roman provinces of Mesopotamia and Osroene. The Persian Shapur I (241–272) captured and sacked the city in 257 AD after doing the same to Osroene, Adiabene, Beth Nuhadra, Beth Garmai and Hatra, incorporating them into the Sassanid Empire. Though destroyed by Shapur I, the city remained inhabited until the 12th and 13th century, when it belonged successively to the Zengid dynasty and the Ilkhanate. It was then abandoned and in part used as a cemetery. The territory around the ancient site was occupied by the Islamic State of Iraq and the Levant (ISIL) in 2015. Since ISIL had destroyed a number of ancient Assyrian sites, including the cities of Hatra, Khorsabad, and Nimrud, fears rose that Assur would be destroyed too. According to some sources, the citadel of Assur was destroyed or badly damaged in May 2015 by members of IS using improvised explosive devices. An AP report from December 2016 after the Iraqi forces had retaken the area, said that the militants tried to destroy the city's grand entrance arches, but they remained standing and a local historian described the damage as "minor". As of February 2017, the group no longer controls the site, however it is not secure enough for archaeological experts to evaluate. ^ La Boda, Sharon (1994). International Dictionary of Historic Places: Middle East and Africa. Taylor & Francis. p. 89. ISBN 978-1-884964-03-9. ^ A Companion to the Archaeology of the Ancient Near East "In 614 BC Assur was conquered by the Medes under king Cyaxares (625-585 BC)"
^ The Fall and Rise of Jerusalem: Judah Under Babylonian Rule "the Medes left Arrapha, attacked Kalhu (Nimrud) and Ninuwa (Nineveh), and continued rapidly northward to capture the nearby city of Tarbisu. Afterward, they went back down the Tigris and laid siege to the city of Assur. The Babylonian army came to the aid of the Medes only after the Medes had begun the decisive offensive against the city, capturing it, killing many of its residents, and taking many others captive." ^ Geoff Hann (2015). Iraq: The ancient sites and Iraqi Kurdistan. p. 246. ISBN 9781841624884. ^ "History of the city". Assur.de. ^ Mezzofiore, Gianluca; Limam, Arij (28 May 2015). "Iraq: Isis 'blows up Unesco world heritage Assyrian site of Ashur' near Tikrit". International Business Times. Retrieved 24 August 2015. 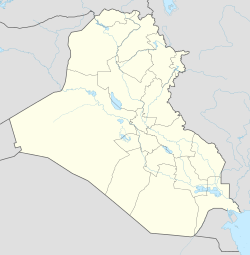 ^ "Iraq Assur | AP Archive". www.aparchive.com. 2016-12-11. Retrieved 2019-03-25. ^ "Iraqis seek funds to restore cultural artifacts recovered from ISIS". Associated Press. CBS News. February 24, 2017. Retrieved October 8, 2017.